Last night, when I saw the episode 11, I noticed that Rancho Rosa logo in the opening credits was in blue tones. 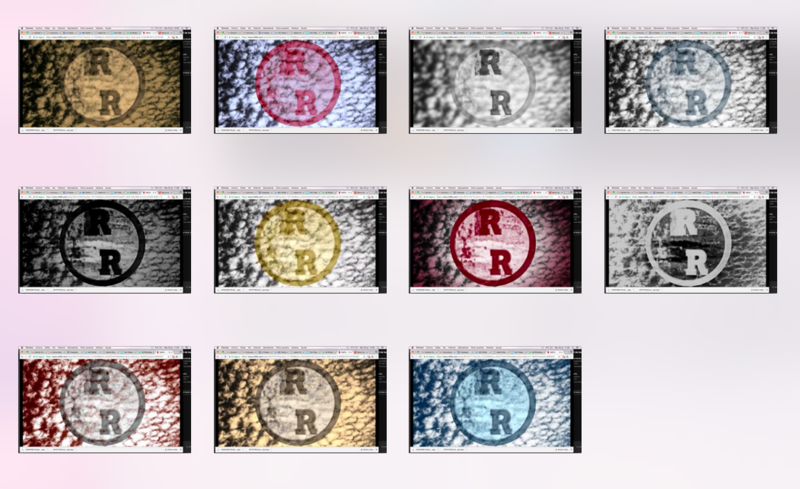 I never realized about the colours in that logo, so I made screen captures of all the RR logos and found that all the episode so far are with different tones. Maybe it's only an art direction decision, maybe it is a random thing (I don't think so) or maybe means something. The order in the picture is from 1 to 11, if you want to analize de colours. No hay estrellas y no hay banda. I was going to go back and look at the colors, thinking there were only two or three, and see if I could discern a theme in each episode for each color. I've wondered if the colors coincided with the episode content. Unfortunately, all the parts are starting to blur together and I'm having trouble deciphering what happened during which hour, so I can't tell anymore if the colors have specific meaning. Definitely these are color clues as I have posted on in previous episodes, with the rancho rosa screen giving a sort of theme for each episode, and the electricity on this screen indicates a sort of energy or becoming, with moves being made in the areas the color represents, change coming to the 'ideas' represented by the colors. Here we had blue and white, and blue is something like failing/sadness/melancholia while white is sort of like being, facts, or surface, what is there, positivity, how people live with a situation, cover up the atomic blast/trauma/death(black inside). We had first the blue trailer, with the old fashioned twin peaks Miriam crawling barely alive out of the woods, old twin peaks is barely alive etc. Then Becky dealing with sadness/failure of her relations with Steven, black inside/Hiroshima coming out, then later the white cover at the diner, which leads into how Bobby is dealing with the failure/sadness of his family after Red shoots up the diner and he confronts the make up of the problem at the traffic jam. AH, my apologies Murat, you have discussed this before. How could I forget. I think I've been overloaded that my internal processor can't keep up the data input. Can anyone suggest a good upgrade? I think it is difficult to interpret each of the colors chosen for each episode, because every episode are very intense and bright! But I think the simplest to interpret are episodes 4 and 11. For me they are in blue tones because it is in 4th episode where Gordon Cole speaks explicitly about "Blue Rose", and in the last one is the chapter in which he has a supernatural experience, seeing the portal and the woodsmen (a more intense experience than get a vision of Laura Palmer). My interpretation of episode 3, 5 y 8 openings are related to Mr C / Dale / BOB. The last episode when we can see Dale Cooper as we know him (or we think we know him) is episode 3, when he travel trough electricity and arrived to “our” world replacing Dougie Jones. For that reason the opening logo is black and white (grey letters, white background, positive). But in the episode 8 opening logo, the colors are the negative colours of episode 3 and 5, because we can see the evil in pure state (probably the exact moment when evil has born on earth in form of BOB), and of course, almost the only known character we saw on screen is Mr C / the negative version of our beloved Dale Cooper. I wondered about the changing colour themes - Part 8 is clearly particularly distinct. As Isabel points out, it appears to be negative (white on black rather than the other way round) and it's the only one that's entirely monochrome. In all of the others, in the text that follows the RR images posted above there are three As that are highlighted in red, whatever the rest of the colour combo is. For Part 8 they're just black. So am I. Can assure you the colours are different for each ep on Stan. Is it possible for a single colour to represent the events of an entire episode? I think why episode 8 had the white color on the circle and the letters, what is highlighted, is because it was about the 'birth of something new' from the atomic blast; with the woodsmen emerging from the atomic fire, changing the song on the radio which changed all the ordinary people, and the new for of life in that frog/insect abomination which took over the girl. I don't think so, too. Maybe we have to wait until the end of the season. Maybe at the end we can find some pattern in the colour titles and their connections. (For example, all in red tones were about something in particular, all the black and white ones were about other things, etc). Can we please revisit this now that the season is over? The last two RR cards in the last two episodes were definitely related, and it seems that the episodes provide a single, united ending when played simultaneously (what I have been calling the 2 birds, one stone ending). I wonder if these colors could be codes for how elements in the episodes may directly relate to each other.